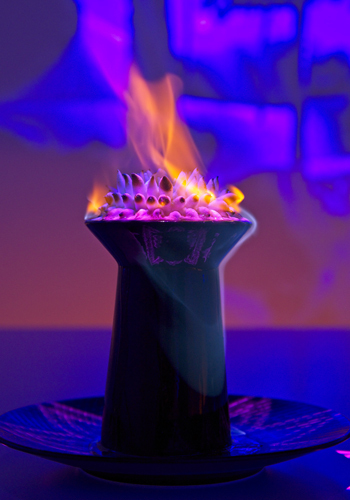 Fine dining is a unique experience, even more so when all five of your senses are immersed in it. At Enfin by James Won, you get to experience just that. 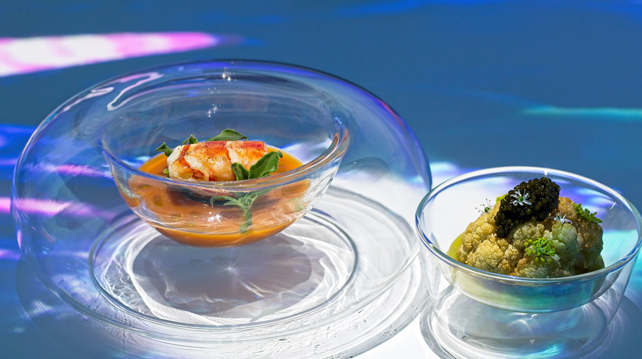 Together with Hennessy and Tapestry Malaysia, the eatery is offering guests a one-of-a-kind dining experience in Malaysia where gastronomy meets next-generation technology. "The menu shows the best of Malaysia for what it is," says Chef Won. "From the tropical forests to the majestic oceans and calming highlands, covering flavours that are truly Malaysian at the core. Connecting diverse backgrounds and multi-racial ethnicities with food." "The secret to making this dining experience truly immersive is how we use technology as a way to tell a new story," says Chef Won. "It's a theatrical production but on an entirely different platform where food plays a leading role in this new form of artistic expression." Lucky for us, we got to witness this first-hand. 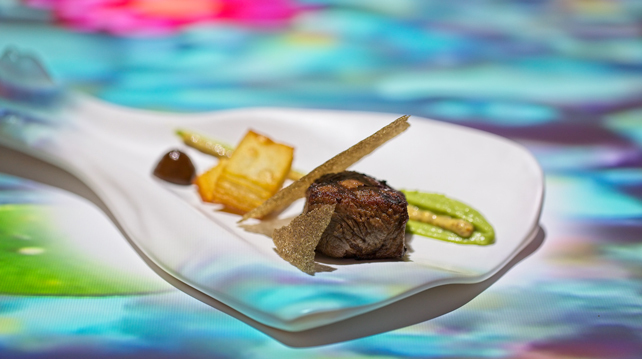 The 5-course dinner, curated by Chef Won, is accompanied by a selection of Moët-Hennessy's champagnes, wines and cognacs. For the entrée, dubbed as Scene One (pictured above), we were transported to the mossy forest floors, among birds and thriving flora. Scene One consisted of foie gras mushroom, black cherries, white chocolate nuts, mushroom tartare, truffle egg yolk, roasted quinoa, pickled shallots and cornichons. The entrée was paired with a glass of Krug champagne. 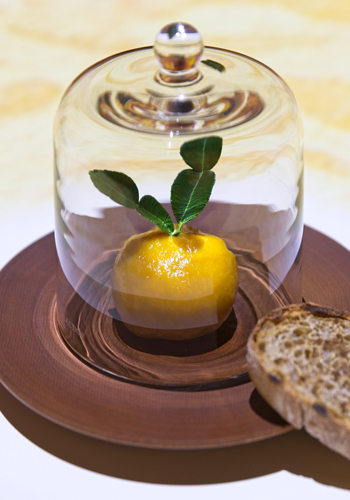 Scene Two came in the form of a kumquat sitting under a glass dome. Cutting into it revealed smoked mackerel with rendang confetti, ginger torch, and a laksa emulsion centre. It was served with kaffir leaves and crispy rye bread. Toss it down with a glass of Terrazas de los Andes Reserva, Chardonnay from Argentina, and you'll be smiling from ear to ear. We have to admit, it was Scene Three that we loved best. Lobster bisque served with caviar, vegetable roulade, and burnt cauliflower. Just thinking about it again makes our mouths water. All around us, the walls portrayed an underwater paradise full of colourful fishes, thriving corals and playful turtles. No lobsters around but we can guess where they went to. The dish was also paired with the Chardonnay from Argentina. For Scene Four we could choose from either Garoupa fish served with dried scallops, shrimp and fermented chili or wagyu beef with Sarawak peppercorn veils, charred broccoli, cape berry mustard and wild fermented chili olek. We went with the latter and it was an explosion of tender, melt-in-our-mouths beef with a kick of spice from the mustard. It came with a chilled glass of Cape Mentelle Shiraz from Margaret River, Australia. We had a hard time dividing our attention between mouthfuls of delicious wagyu and the charming scenery of Melaka on the walls. The final scene was the coconut bombe Alaska that was set literally on fire (by a waiter drizzling some Hennessy X.O on it and lighting it up). The dessert had a spiky layer of cream covering a hard shell of dark chocolate which contained a dark cocoa sponge. It was paired nicely with a glass of Hennessy X.O on the rocks. The course was perfectly complemented by the starry night sky surrounding us, giving off a serene ending to our lovely night. This Enfin by James Won experience is available from now until 9th November 2018 and the 5-course menu is priced at RM999+ (with alcohol pairing) and RM750+ (without alcohol pairing) per person.